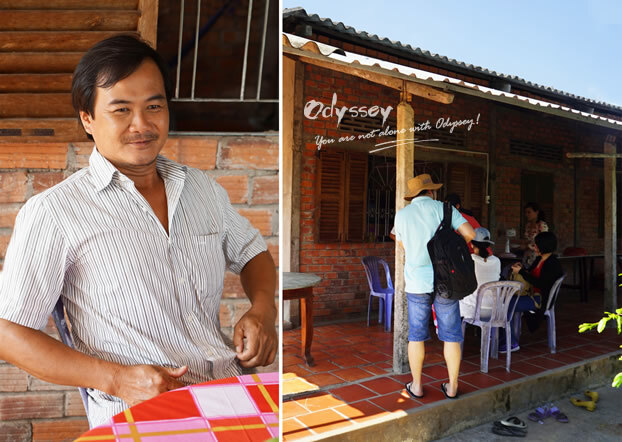 Many Travelers to Ho Chi Minh City come for a taste of the bustling city center. But it was in Cai Be that I saw the other side of HCMC, whose tranquil rural life is longed-for in urbanites' hearts. Originating from the Tibetan Plateau, the Mekong River flows southward through the largest number of Asian countries, including China's Yunnan province, Myanmar, Laos, Thailand, Cambodia, and Vietnam. 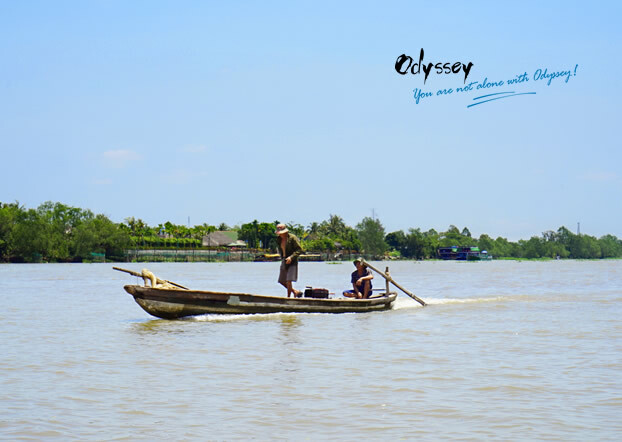 The fertile Mekong Delta, a rich and prosperous land for people to live on it created has given it the name of Mother River. I have always wanted to have a glimpse of the most important body of water in Asia and luckily, I was able to see Mekong and Cai Be while traveling in Ho Chi Minh City. A classic view of the Mekong and its dwellers. 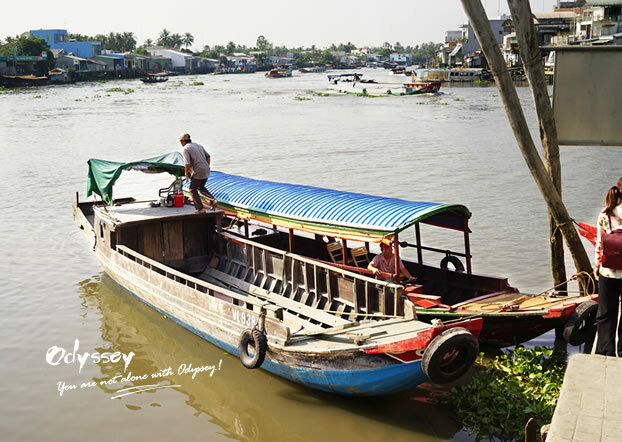 Cai Be, famous for its busy floating market, is one among the villages nearest to the estuary in the Mekong Delta. Since the floating market opens at 6 a.m. and ends about 1.5 hours later, one is advised to stay for one night to catch the floating market the next morning. Wooden boats painted with bright colors and fish eyes. Due to limited time, we left for Cai Bei from Ho Chi Minh and arrived at 8 a.m., but the market had already gone with only a few scattered boats left. 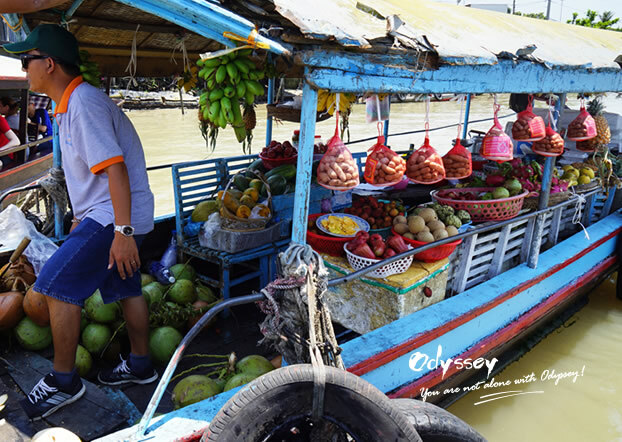 In the sunny weather, our private guide, Nancy, warmly welcomed us to board a motor boat, by which we began our Mekong Delta tour. We boarded a motor boat to start our visit to the Mekong Delta. The view of the Mekong in front of me is about 30 to 40 meters in width. Gentle and winding, it flows into the embrace of the ocean a few kilometers away. 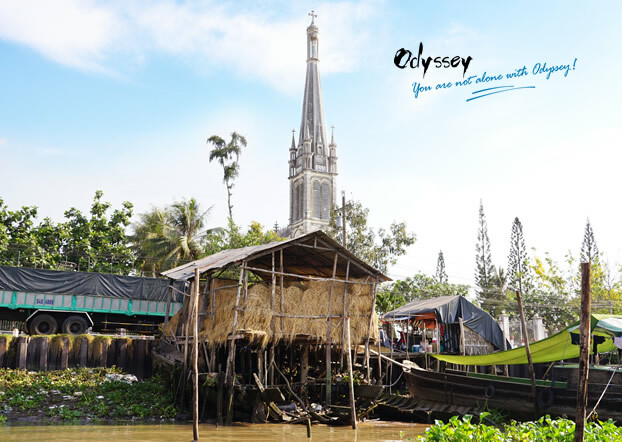 Without the bustling buying and selling, the lazy shuttling fishing boats, the high and low stilted houses on both banks, the cottages are hidden among trees and the small Catholic Church together present a lively scene of leisurely life. Once in a while, a loaded cargo ship would come into sight and entice travelers to take pictures of it. A Catholic church built at the beginning of 19th century continues to preach the gospel to believers. Each silted house is like a dock, allowing one boat to moor in front of it. A commercial boat selling fruit: a green coconut hung on a long bamboo pole erected on the stern of the boat clearly shows what the boat sells to people at a distance. But when I realized this use of the coconut, my boat had already cruised too far and I missed the chance to take a picture of it. The green coconut selling boat. Nancy explains that more and more fishermen have abandoned boathouses and moved inland. 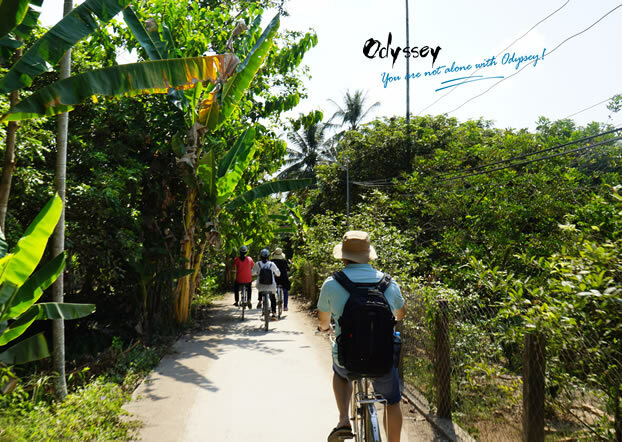 Because of the development of tourism, the government encourages Mekong Delta residents to show visitors the process of making traditional Vietnamese food, and to make a living by selling specialties, which at the same time boosts the economy. 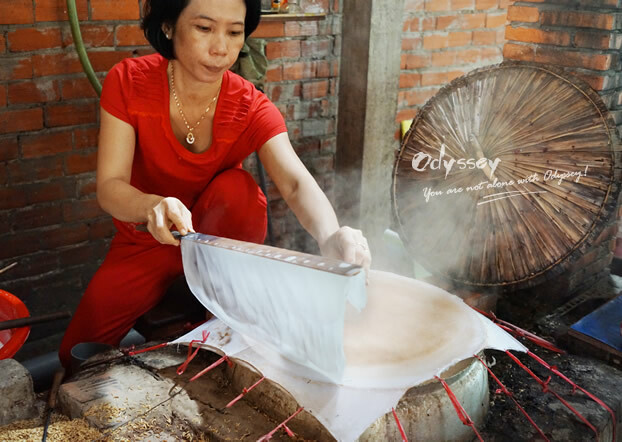 We stopped at a small dock and visited a couple of workshops for various Vietnamese specialties, such as coconut candy, sweet pop-rice cake, spring roll skin, and traditional collected honey. 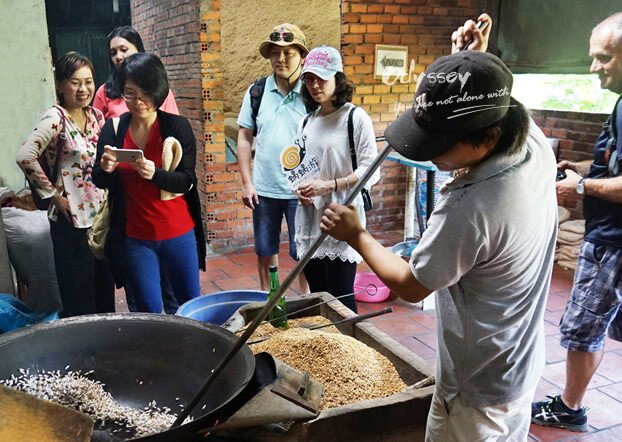 In every workshop, visitors are not only welcomed to watch how these specialties are made, but also invited to try free samples. There is no pressure if you don't wish to buy anything. The process of making traditional coconut candy goes like this: first, open a coconut after draining the juice; second, use an iron tool to separate the pulp from the shell; third, boil the pulp in a pot until the coconut oil comes out; forth, add sugar into the pot; finally, cut it into small pieces after it cools down. To fry traditional pop-rice, people put iron sand in the pot to keep the temperature at a whopping 300 °C. This way, the pop-rice will be very crispy and delicious, since the rice pops immediately when it touches the pot. Seeing this translucent rice-made skin, can you imagine how the thin and tender skins of Vietnamese spring rolls were made? The tool is simple: a piece of flattened white gauze on a steaming pot. When the water boils in the pot and the steam rises, a spoonful of rice milk is spread on the gauze. A few minutes later, the rice milk turned into tender rice-made skin that can be used for fresh rolls or deep fried rolls. After a few snack samples, Nancy joked that we should do some exercise to keep fit. So, here we go! Cycling around the countryside, we enjoyed plenty of shades along the ride, the gently blowing breeze, running dogs and roaming roosters. That just doesn't happen every day! The road is flat, safe and wouldn't cost much effort to ride on. Riding through a winding path, Nancy took us to a rustic house situated among shiny green grass and trees. With red brick walls, asbestos roof, wood blinds, and red floor tiles, it looked quite conspicuous in the sunshine. The host, Mr. Hai, was nice and reserved just like any typical Vietnamese man. He greeted us to sit by the small table under the eave. Mr. Hai and his house open to visitors. 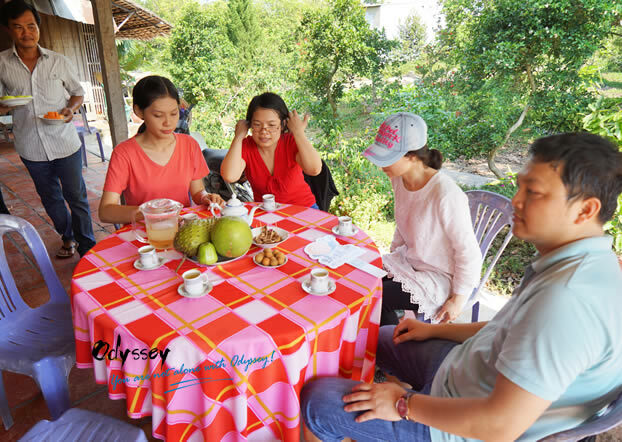 Soon he and his wife brought us fresh fruits, snacks, and tea, and cordially invited us to have a taste. We were told that Mr. Hai grew these fruits, which were highly appreciated by travelers who live in urban areas where organic food is rare. I gorged myself on the delicious fruits, which was so refreshing in 40 degrees Celsius. 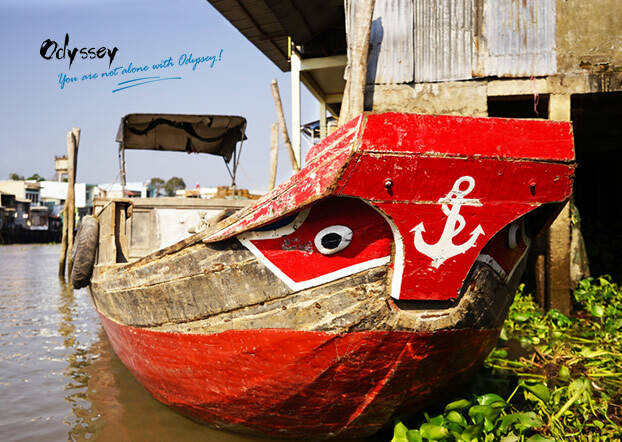 The Hai Family has lived on this island for many generations, so they have deep feelings for the Mekong. 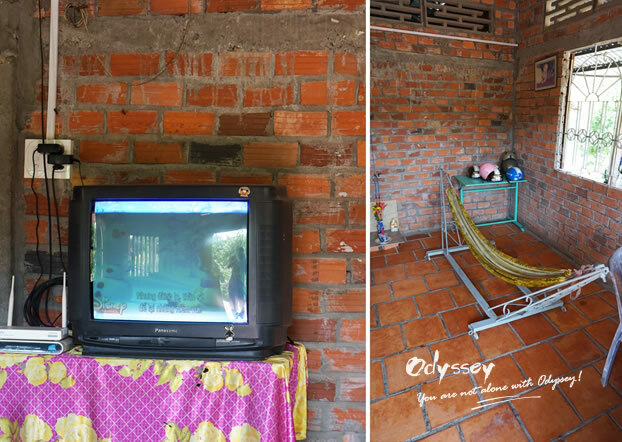 Walking into the living room, you can only see simple chairs and tables, a hammock and a TV, the interior walls are even not covered by cement. The plain set-up of Mr. Hai's living room. The family is definitely not wealthy, but they have satisfied smiles. 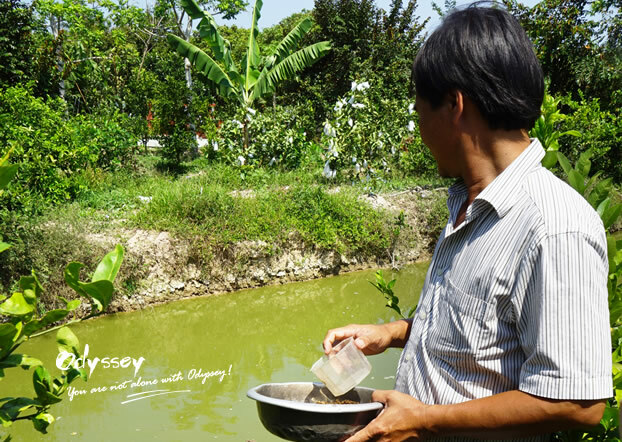 Mr. Hai and Mrs. Hai take care of their orchards, the fields and over 3,000 "elephant trunk fish" in the fishpond, from which they make about $2,000 a year. Except for their kids' tuition, they don't have much extra expense. Mr. Hai's family was expecting a good harvest from the fishpond in autumn. Mr. Hai showed us the tool he made for picking fruits. 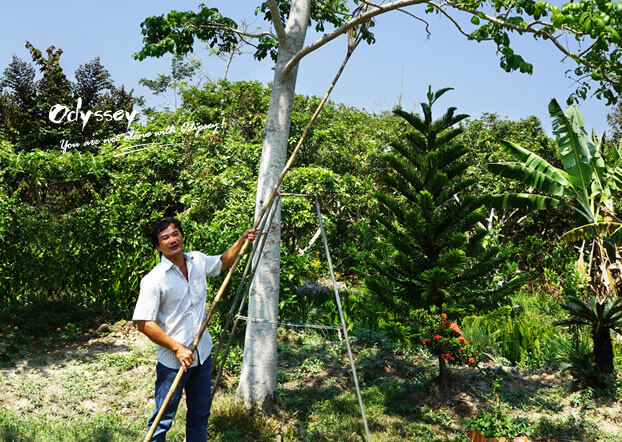 It is a long bamboo pole with a small spindle-shaped basket woven from the branches at the end. There is an opening at the side, so when the fruit is enclosed by the basket, you just need to pull the pole fast and hard, the fruit then will fall into the basket. Don't you call him a genius? That's how the fruit we ate came down! Nancy told us that Mrs. Hai is a locally known singer, who is often invited to sing folk songs in events held by villages nearby. Even before we asked, Mrs. Hai decided to sing us a traditional Vietnamese love song. Along singing, she was holding a wooden metronome and used the beat to accompany the song. Although we couldn't understand the lyrics, the sincere emotion of the tunes and her sweet voice had us. She was born a singer! After one song, we couldn't help cheering encore. This time, Mr. Hai joined her and they performed a duet. The song was roughly about a young man who came to his beloved girl's family to propose marriage. The girl asked difficult questions to embarrass him, but he handled those questions with wit and with a genuine heart. The shyness of Mr. Hai had completely gone when he started to sing with his wife. The couple, one is composed and the other easy-going, infected us with their joyful air. Following the rhythm, we clapped along. In the end, we sang a song in return. Music must know no borders, for when we sang Mrs. Hai followed our tune and sang it in Vietnamese! Magic!  The couple singing in duet. How time flies! We left Mr. Hai's house unwillingly when noon arrived. 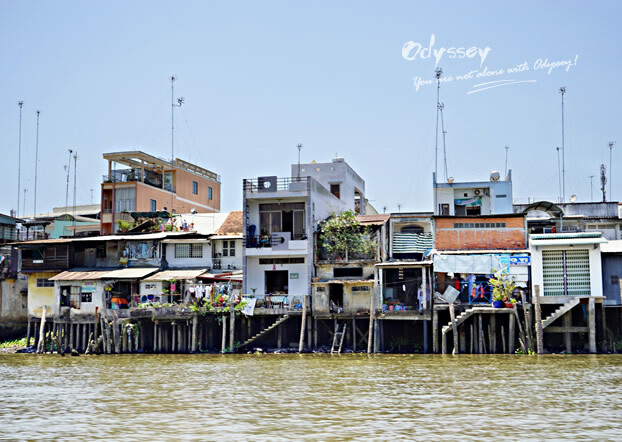 We took a boat back, on which everyone expressed the yearning for idyllic country life, which reflects thousands of people's life by the Mekong for ages. Yeah, Cai Be is the place not to be missed when it comes to experiencing the traditional customs of Southern Vietnam and appreciating the unique beauty and abundance of the Mekong. The fresh guava picked from the orchard was the best souvenir!